Despite a hitherto lukewarm response to its overtures, Moscow is continuing with an intensive diplomatic plan to encourage Tehran to suspend parts of its nuclear programme. For the past few years, two assumptions have underpinned Russia's policy on Iran. The first is that no-one has proved beyond doubt that Iran is planning to develop nuclear weapons. Tehran has certainly begun the industrial production of enriched uranium, but this is only low-enriched uranium (LEU), which cannot be used in the production of a bomb. The International Atomic Energy Agency has itself accepted that it has received no evidence that Iran's nuclear programme has military applications. The second assumption is that driving Iran into a diplomatic cul-de-sac would be counterproductive. Indeed, even if Tehran is concealing a great deal and does have plans to produce the bomb, Moscow believes that pressuring it with threats or force could prove dangerous. Experience of dealing with North Korea has shown precisely how threats of force and sanctions can go wrong. At the heart of the problem is the fact that little scares Iran. With the United States bogged down in Iraq, Tehran knows threats of military action are largely bluff. On another level, the economic sanctions imposed thus far have been far too blunt to impede Iran's development in any real way. An embargo on oil exports would obviously present the most serious threat to the Iranian economy. But the Iranian authorities are convinced - with good reason - that neither China nor Russia will allow it. It is unlikely that Europe itself is ready for such sanctions either. In summary, neither the threat of force nor imposition of sanctions are likely to affect Iranian policy. Indeed, it is arguable such measures would only serve to strengthen the hand of people such as President Mahmoud Ahmadinejad, who plays on populist fears of the outside world to divert attention from the country's economic woes. The Iranian side have, of course, taken equivocal positions. 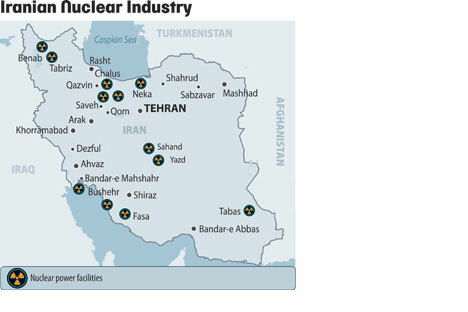 Two years ago, the six-nation group dealing with the Iranian problem made Tehran a remarkably lucrative proposal in offering to build nuclear power stations in Iran, admit it to the World Trade Organisation, and supply it with spare parts for aircraft in exchange for abandoning uranium enrichment and developing civilian industry. Tehran turned its back on the opportunity. But what this does not mean is that Tehran wants to build a nuclear bomb. Indeed, it is arguable they have no real target to drop it on. America is too far away. Israel has as many Arab Muslims as it has Jews. Iran claims to be the leader of the entire Muslim world and cannot afford to destroy Israel. Rather, intuition would suggest Iran instead wants to become a threshold state, to enrich enough uranium to make others suspect that it is one step away from the bomb. In late March, the Security Council will again resume discussion of the Iranian issue. As Tehran has ignored all of its previous resolutions, the world community should clearly pursue a firm carrot and stick approach. Fuel supplies to the Bushehr nuclear station, currently powered by Russian uranium, offer a particularly good opportunity for leverage. But if Tehran does decide to cut back on its nuclear programme, the world should be clear that both Moscow and Beijing are intending to do everything to prevent the Security Council from passing what they regard as disproportionately tough resolutions.